Notes: Turner F17. Cairn heading the easterly of the two Collard Tor rows. "The easterly cairn at SX 55846203 measures 8.1m. in diameter and 0.6m. high. The centre has been excavated, but apart from a large prone slab there is nothing to suggest a former cist. The mound is surrounded by a peristalith of boulders each of which is 0.9m. high and roughly 0.5m square. The row is similar to the other row and can be traced for 79.6m." Notes: Butler Collard Tor 1. "Two stone rows each headed by a cairn lie on a gentle clitter-covered south-facing hillslope between 239m and 259m above OD. The rows which are oriented approximately north-south, diverge from their northern ends and are from 17m to 19 apart; a field bank interrupts the course of the east row. The precise lengths of the rows are difficult to determine partly because they appear to have been slighted and partly because of the presence of clitter and earthfast stones which hamper identification of the individual stones. The deduced lengths of these rows (excluding the cairns) are 75.4m and up to 97.2m respectively however because of the disturbed nature of each row these measurements are by no means certain. A count of the upright and clearly definable stones revealed 10 in the west row and 13 in the east row , but these figures provide a totally misleading picture of the somewhat jumbled and chaotic distribution of moorstones in each alignment. The heights of the uprights range from 0.3m to 0.9m with one very large damaged stone 1.3m high. Both cairns have been badly disturbed: the western mound is 8m across and 0.6m high and the eastern mound is 8.5 m across and 0.6m high". Lethbridge pp.55-7, diagram p.55. Notes: Butler Collard Tor 2. Described in entry for Collard Tor E. Lethbridge pp.55-7, diagram p.55. Notes: Dewerstone hill pound is on the summit of the ridge separating the valleys of the plym and the meavy at their junction. The pound wall is incomplete. It ties in on the w side with the rock exposure of the summit. It is rectangular with rounded angles. Mean elevation of ground approx.216m od, sloping slightly e and w. There is one hut circle. Two ruined parallel walls cross the neck of the ridge 137m n of the pound. There is a 2.75m space between the walls which are about 1.55m thick. There is a confused mass of ruined buildings within the walls. 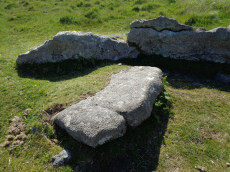 Notes: A poorly preserved stone-built double walled enclosure, the outer of which is thought to represent the site of a Neolithic hilltop enclosure. "The outer enclosure is potentially Neolithic, while the inner is probably of Bronze Age date. The stone-built double wall of the outer enclosure is poorly preserved with an average height of 0.7m, and given its loose composition is unlikely to have stood higher than 1.5m. The inner and outer walls now have average widths of 4.0m and 3.4m respectively. Five probable or possible entrances through the double wall were identified; the existence of so many may support the hypothesis that the enclosure is of Neolithic date." Notes: "stone hut circle forming part of an enclosed settlement on the summit of dewerstone hill "
Notes: Turner A45. "Stone ring with an annular bank. The interior is part infilled with small stones and boulders to 0.3 meters or less below the bank top. This cairn measures 15.5 meters in diameter, with a bank 1.3 meters wide and 0.4 meters high. The interior has been dug into. Situated on a level summit." Notes: Turner E2. Barrow. A barrow lies 109.7m west from the retaining circle (sx56se/24) of the stone row on shaugh moor. There is a kerb of stones visible and a wider spread of material up to 12.19m (worth). Barrow diam 12.19m, height 1.524m. Notes: Turner E3. ring cairn or traces of cairn with retaining circle, found by plymouth archaeological group 1959. Diameter 11.5m, height 0.3m. No.416. Vis=-/7/1959 (ancient monuments). Cairn, height 2ft, diameter 30ft, east of and close to stone row. Distinct stone kerb with low flat mound within. Notes: Enclosure G; one of seven enclosures with associated hut circles in the area. It is a square enclosure with three associated hut circles and another few lying in close proximity. The enclosure walls remains reasonably intact. Other details: Butler Vol 3 Map 48, 3. Notes: Turner Stone circle G18. "Whether the stones represent the remnants of a stone circle, a cairn circle, or even a hut is debateable". 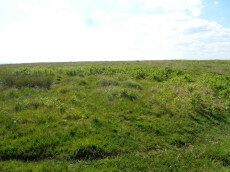 "The remains of a circle of stones lie on a north-west facing hill slope at 256m above OD on unenclosed moorland. It survives as a partial ring of five boulder and stones with an off-centre earthfast boulder; the overall diameter was approximately 10.0m to 10.6m across. The largest of the two slabs which remain upright is 0.8m high, 1.7m wide and 0.3m thick." Notes: Turner A31. "Ring cairn, wigford down. Internal diam 2.7m, with bank 1m wide and 0.2m high. Smallest ring cairn (diam) on dartmoor. Turner suggests a link between the construction of this, small, ring cairn, with the larger cairn sx56nw/11 to its nw."